Kenneth’s first box of chocolates given by Uncle Darrel Sept. 7, 1926. The old box is fragile; it was constructed of paper but, it had survived over the course of eighty-eight years! I imagine that Kenneth left the box behind when he was no longer a boy; while his mother neatly tucked it away for sometime in the future. Carefully, I opened the box and discovered a handmade stuffed elephant. . . This was precious; I felt a tingle up and down my spine – the spirit of the gift survived. Eighty-eight years later, I understood the sentiment. The first step or the first word or the first box of chocolate mark moments in time that become more meaningful over the course of a lifetime. Here I stood with this memento with its beautiful art deco design – deep blue lovely actually. I dusted it carefully and placed it on a table. Old Ramer’s Chocolate Box. Good Condition. Measurement 10″ x 4″ approximately. The craftsman era is reflected in the graphic tree with fruit while the peacock seems more reminiscent of art deco . 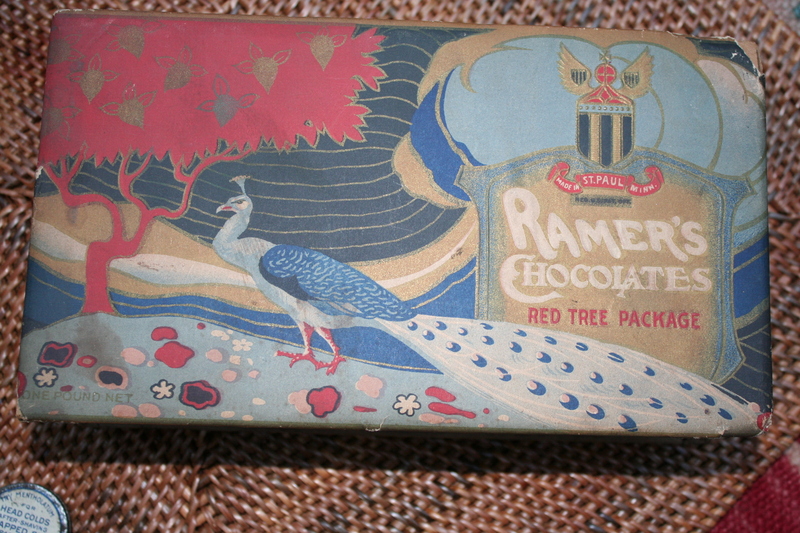 . .
Whatever the inspiration, the brilliant blue, red rose and linear horizontal graphics eventually lead to the logo for Ramer’s Chocolate. The logo is repeated on the side of the box . . .
We are selling this advertising box as found . 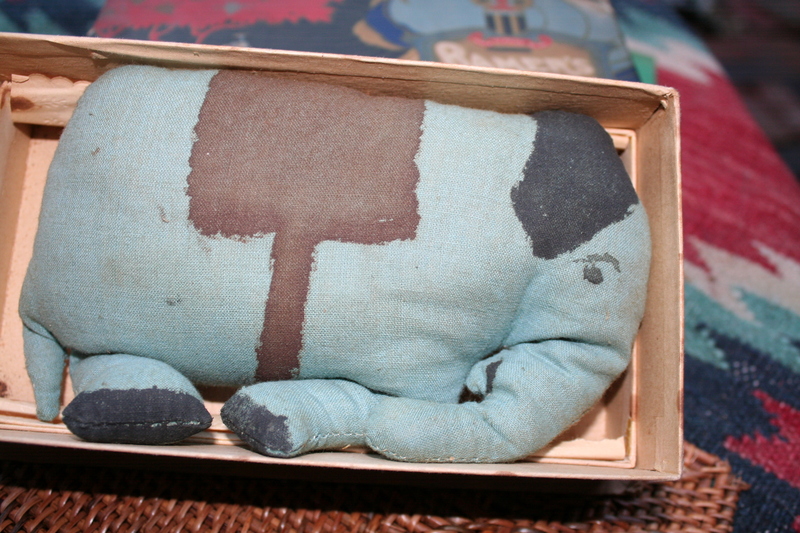 . . upon opening the box, we were surprised to see a handmade elephant tucked inside, no doubt, an attempt by Kenneth’s Mother to save one of his childhood toys. This is a treasure. Measures about 10” X 4 1/2 X 3 1/4. For a while, I had the pleasure of enjoying the box on the table. I wondered if anyone in the world appreciated the bits and pieces of the past. Maybe no one will ever . . . I would say to myself. But one evening, the Etsy Notification sounded . . .TMA had just ordered the Ramer’s Chocolate Box! I was a little let down, no longer would I see the beautiful graphics as I passed the table. I worried also – why did someone want this box? I carefully packed the chocolate box. I also reiterated to the new owner that this was a precious chocolate box. My Aunt did say that my grandfather’s family was from the midwest, so I am definitely going to do more digging. An incredible history for an empty box of chocolates drawn from the early days of electricity to the age of the internet. I wonder if Tanya’s grandmother was there the day that the box of chocolates was shipped to Amesville, Ohio. It is entirely possible; the A. M. Ramer Company did not survive the great depression a few years later. Lately, I have been spending some time reading about the company – I have found so many interesting details. The facility built in ca. 1916 cost a staggering 375,00.00! 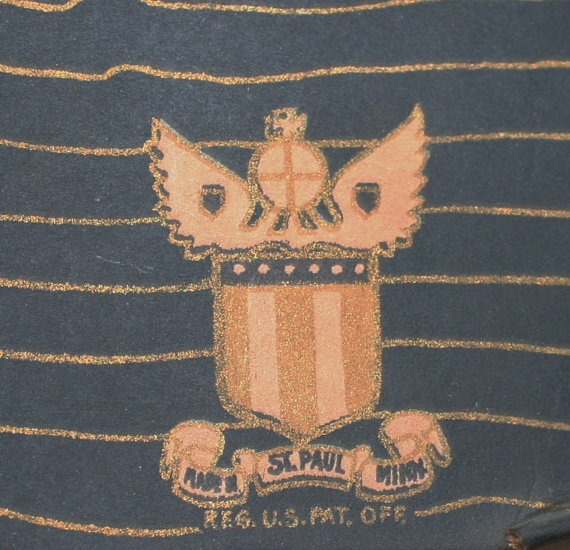 Saint Paul was becoming the candy capital of the world. 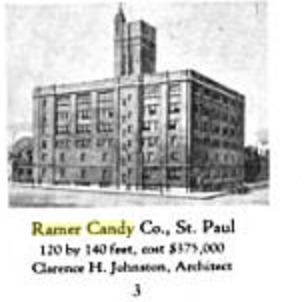 And Mr. Ramer was a part of the growth of the candy industry and the growth of Saint Paul as a manufacturing center. The train from Chicago would pass the candy companies – no doubt passengers enjoyed a sweet treat! But fortunes rise and fall, then as now. All that remains of the A.M. Ramer Candy Company is the bond of family. The spirit of the gift survived long past the lives of Kenneth and Uncle Darrel; the spirit of the gift lives now in the life of another family. A Circle. The circle of giving . . . Nice. One last thought, I won’t worry about my descriptions being rather long or overly sentimental. Well, not so much . . .